BVRDACO – amplifier/line monitor, with auto-changeover. BVRDCI – 16 x analogue voltage sensing inputs. BVRDFPI – fire panel interface. BVRDADC – DC line monitor. BVRDIF1 – auxiliary/music input interface. BVRDIF1T – auxiliary/music input interface with isolation transformer. BVRDIF2 – microphone input interface. BVRDIF2NET – microphone input interface for networked racks. BVRDIF3 – data microphone input interface. BVRDIF3NET – data microphone input interface for networked racks. BVRDIF4 – VIGIL2 amplifier input interface. 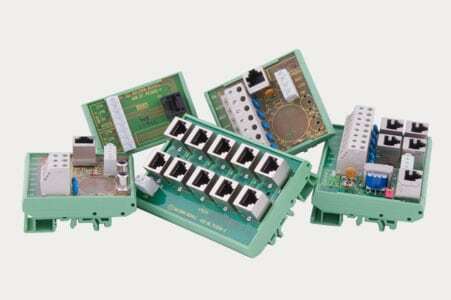 BVRDP5 – RJ45 five-way patch board.